Obama faces opposition from private healthcare, Republicans fearful of "socialism"
(CNN) -- The United States is fighting enemies in Iraq, Afghanistan and extremist cells around the world, but there is a much deadlier domestic threat facing President Barack Obama. 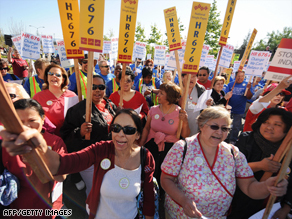 Nurses in Los Angeles rally for a universal single-payer healthcare system. It's the fact that nearly 50 million Americans haven't got enough money to see a doctor when they're sick. By one government estimate 18,000 people die unnecessarily for lack of medical care every year, many times more than terrorists or soldiers target. "Our healthcare system is broken," Obama said this week. Most industrialized countries addressed the problem decades ago, but the U.S. is determined to avoid the most common remedy -- a government healthcare or health insurance system. The U.S. already has government insurance to pay for the poor and the elderly. But to a lot of Americans, especially Republicans, extending that protection to everyone else seems like "socialism." They don't trust Washington to handle their health. So most Americans pay for healthcare privately, usually with insurance purchased where they work. If they can't pay, they don't get it. The result is an enormous, profitable and powerful industry that has successfully fought reform. Obama isn't really trying to change the system. He wants to find a way to enlarge it, to get insurance for the millions who don't have it. The president has a plan and met with Congressional Democrats this week, urging them to write it into law by the end of the year. Several presidents have tried before and failed, but the politics may be more promising now. With the economy in such deep trouble, more Americans are afraid of losing their job and the healthcare that comes with it. Some medical organizations and industries have also announced that this time, they'll cooperate. That leaves one big problem. Washington would have to find a lot of money: by most estimates, well more than a trillion dollars in the first 10 years. Obama's administration is already spending and borrowing record amounts. People around the world remember some of Obama's big promises -- to withdraw from Iraq and close Guantanamo Bay. But healthcare reform will actually have a much bigger impact on most U.S. voters and they are expecting the president to deliver.